At the end of last year wine experts and lovers finally got the first answers to the annual cardinal question: What is the new 2004 vintage like? After we had a chance last summer to taste this year’s wines from Chile, Australia, and New Zealand, where grapes are harvested in spring but there are no official celebrations of young wines, it was good old Europe’s turn. The craziness surrounding new wine in Europe began on 6 November in Italy, with its Vino Novello. They compare it to a virgin girl, so it can first be imbibed on Virgin Mary’s Day. On St. Martin’s Day (11 November) the Austrians, Slovenians, Czechs, Moravians, and Slovaks follow suit. In the former Austro-Hungarian empire that day marked the end of the agricultural year and new contracts were closed over new wine and roast goose. 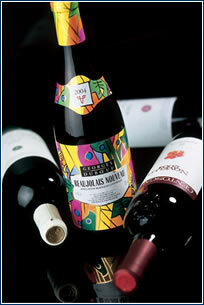 Around the world, the first bottles of Beaujolais Nouveau were opened at midnight on the third Thursday of November. True, a traditional saying has it that “young wine and old women are gifts from the devil,“ but in the case of good young wines, the saying’s accuracy is a bit questionable. The complicated natural process of changing grape juice into clear wine is a very risky matter for vintners, as even good grapes can produce a miserable product with poor taste and aroma if mishandled. Wine is the only alcoholic beverage that is not heat processed, so humans can only humbly assist nature. The change of juice into wine involves a process of converting natural sugars to alcohol and carbon dioxide. One can begin speaking of wine at the moment when the yeast completes its miraculous work of converting sugar to alcohol. The alcohol kills the yeast, and billions of dead yeast organisms sink to the bottom of the keg or tank. The cloudy liquid becomes clear, but even without filtering new wine can be tasted. Many vintners from the Beaujolais region have gained fame thanks to young wine. Due to outstanding marketing they sell most of the harvest as young wines that would not survive time and remain drinkable. Unfortunately, most of these wines are made from only the blue Gamay varietal, so they lack the variety of Italian and Czech wines. In the Czech Republic the new wine tradition was revived in the 1990s, and today most major producers sell new wines. In Italy and France vintners were happy, as the weather was sunny for the 2004 harvest, while in this country the grapes were harvested later. So what’s the new wine like? A fairly representative sample is presented in our wine guide (facing page). They’re exactly as they should be – young and fresh, with pleasant aroma and fruity flavors. They indicate that, despite vintners’ complaints during the growing season, the 2004 vintage could be very good. Real connoisseurs know that wine tastes best at a specific temperature. 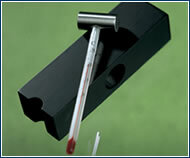 This sleek thermometer from Philippi will help you to seize the moment. CZK 1,095. Jan. 25 – a dinner with winemaker Olivier Leflaive from the Bourgogne Puligny- Montrachet winery, who will present a combination of food and wines. The six-course dinner will cost CZK 2,500. Beginning at 7pm. Jan. 27 – also at 7pm a presentation of wines and cheeses will take place. Entrance fee CZK 200. Here are samples of new Champagnes on the local market. Characteristics: This original Moravian white is among the first varietals harvested, and the 2004 vintage stands out for its pleasant muscat aroma. Characteristics: This traditional central European blue varietal renders a light, ruby-red wine with higher acidity, suitable for fatty dishes and pig roasts. Characteristics: One of the finest new Beaujolais 2004 to appear on this market. Its flavor incorporates fruity tones of green apples and pears. A full, dark red wine, great with cheeses and fatty patés. Served chilled. Characteristics: A pleasantly velvety wine made from Sangiovese grapes, the most widespread Italian varietal, with a mature, fruity aroma and flavor. Price: Italian Novello wines are not yet available on the Czech market. In Italy producers charge 4.61 euros on average.